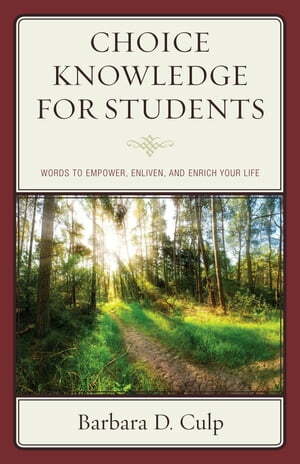 Collins Booksellers - Choice Knowledge for Students by Barbara D. Culp, 9781475835069. Buy this book online. Choice Knowledge for Students enhances the confidence, maturity, and motivation that drives success. No matter where a student stands with grades or abilities, their future depends on excellent education and not only in academic subjects. Their hearts and souls need tending as much as their minds. This book addresses all three! The first section, “Knowledge for Your Power,” nurtures inner strength. Entries like “Rescue Yourself” encourage maturity, ones like “Speak Up” enhance confidence, and those similar to “Keep It Real” nurture honesty and persistence. The second section is “Knowledge for Your Balance.” Entries like “Your Best Friend,” “Let Go,” and “Talk It Out” build a stable foundation for school, work, family, friends, and all the other activities students juggle. Choice Knowledge helps students take charge of academic success as well as their lives!